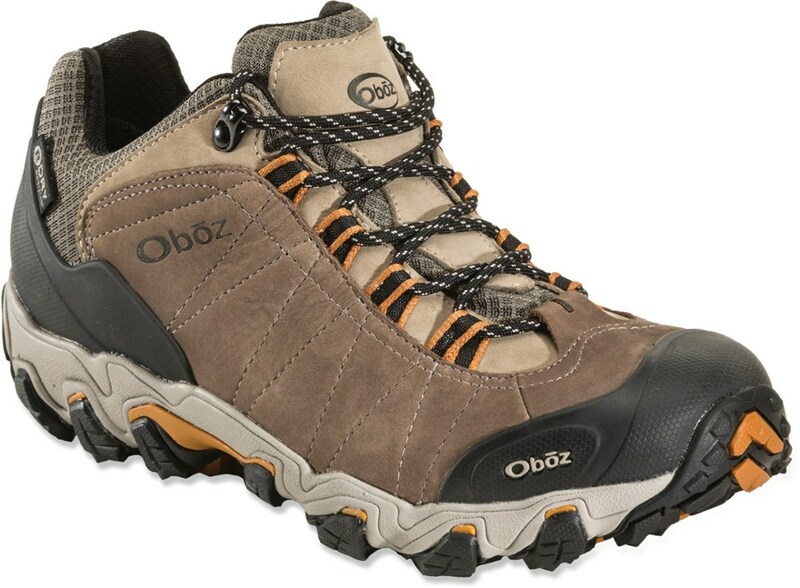 Oboz introduces a very capable hybrid that is part low trail shoe and part approach shoe. It is somewhat heavier and less cushioned than most trail running shoes—so walk, don’t run. It is particularly well-ventilated for an full leather shoe, and the sticky rubber sole has outstanding grip yet ably sheds mud and muck. Durability should be great. 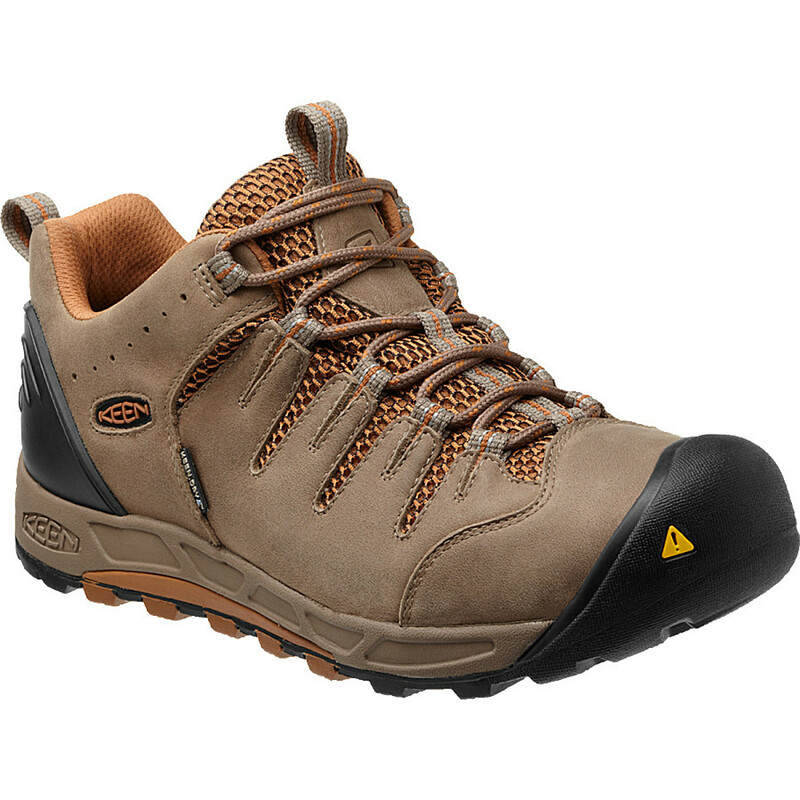 Overall, a near-outstanding shoe: a close-fitting shoe that is all-day comfortable for walking and stellar for rock scrambling. Out of the box, the Teewinot Low pair weighed 2.4 pounds on a digital hand scale. 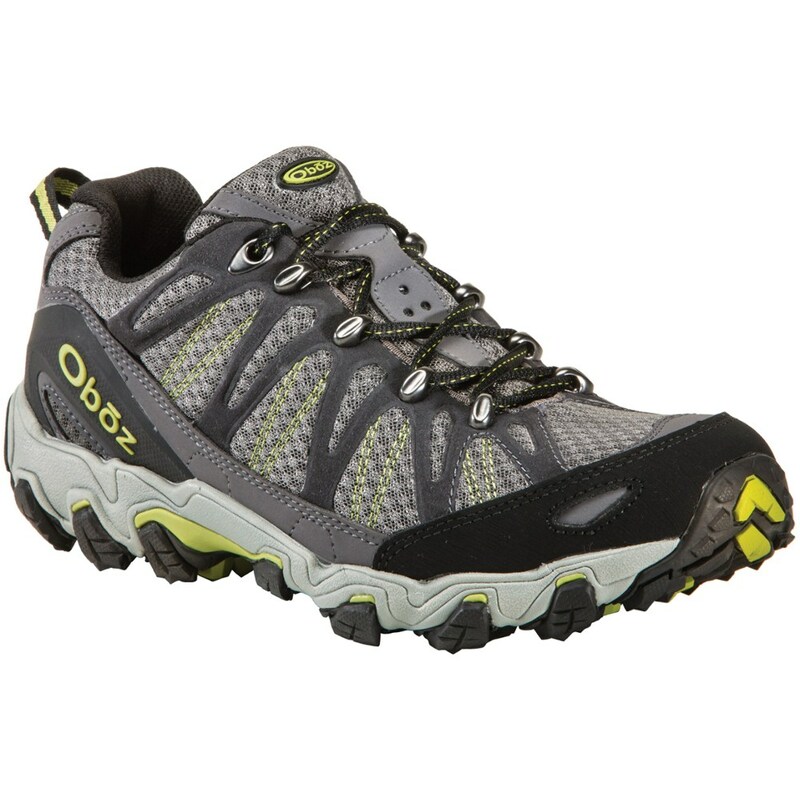 For the sake of comparison, most low trail running shoes in my size weigh less than 2 pounds per pair. 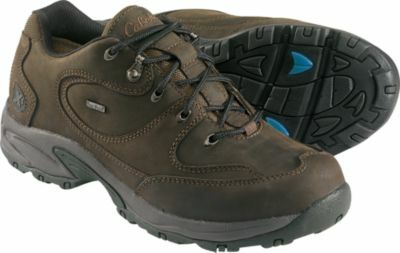 Like most shoes of this category, these require no break-in, though the leather upper does stretch some and mold to your feet over time. 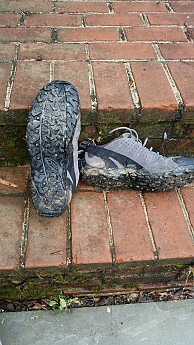 This shoe is clearly not intended to compete in the trail running category for a number of reasons. The Teewinot is clearly angling toward people who like to walk on trails, not run them, and is built for people who like their trails rocky. 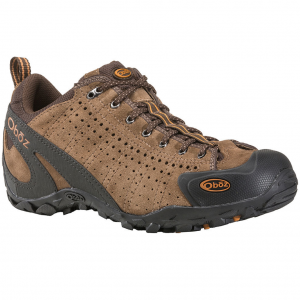 The full leather upper is built to absorb scrapes and abuse and provides great lateral support. The heel cup and toe bumpers are hard, providing much better than average protection for your feet. The laces run through metal eyes that extend close to the end of your feet, offering a better than average ability to keep your feet locked in. Even the tongue of this shoe is protected by a strip of nylon that both keeps the tongue in place and protects it from scrapes. 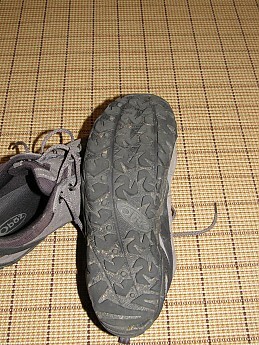 The outside of the shoe - note the holes for ventilation and reinforcements along the side and at the toe, and that the sole comes up at the back. 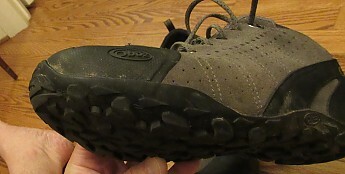 Good view of the sole, right out of the box, never worn, above; and after a few months of use, see further below. Also, a good look at the laces and the strip that keeps the tongue in place. The Teewinot runs roughly true to size length-wise, and the standard 11 ½ provided a snug but comfortable fit for my somewhat wide feet. 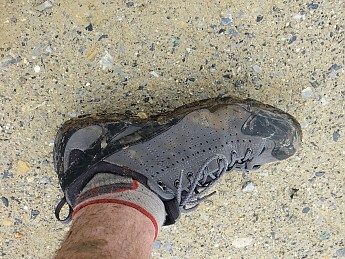 I wore the shoes with mid-weight socks: Darn Tough ¼ Sock Cushion or Point6 Hiking Tech Medium Mini Crew. It’s easy to fit these shoes with laces that run all the way to your toes, a real advantage for keeping your feet in place for steeper rocky trails. The laces are fine, didn’t need to double-knot them, perfect length. I experienced no toe bang in these shoes on steep downhills. For a shoe this close-fitting, I usually put some glide or Vaseline on my toes to guard against blisters; that worked well here. I developed one small blister, but that was after a blunder into a puddle and an hour and a half walking with a wet sock. (as with any all-leather shoe, this dried out overnight aided by stuffing it with some crumpled newspaper. 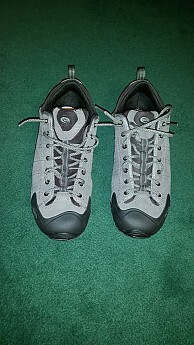 Shoes with a nylon/synthetic outer probably dry a little more quickly than these). This is not a running shoe. 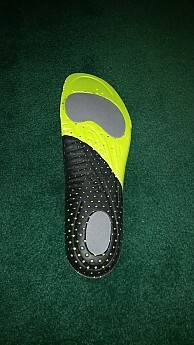 The midsole is very thin and intended to give you better feel for the ground, not cushion your feet. The insole is a plus—extra firm foam under the ball of your foot and heel, plus a hard plastic rear half that provides support equivalent to premium after-market insoles. The black part at the rear and around the heel is hard plastic. The gray parts are denser foam. Overall, the Teewinot Lows are basically neutral in terms of support, with the insole providing enough to deal with mildly flat feet. 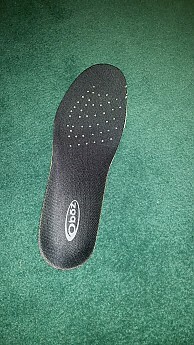 (asterisk – I have extremely flat feet and use custom orthotics. 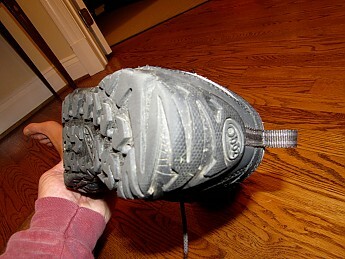 They don’t work with hard plastic insoles like the ones that come with this shoe. I spent some time using the insole that came with the shoe to understand how they feel, but for most of the time, I replaced the stock insole with a no-support insole from an old pair of running shoes plus the custom orthotics). Combine that with a sticky rubber sole that is substantial and an all-leather shoe, and you get great lateral support and virtually no sliding front to back. The front half of the shoe has nice flexibility; the rear half is firm, clearly the result of a half-shank beneath your arch that provides excellent protection from hard rocks. I was absolutely happy wearing this shoe all day, whether I was walking the dog or spending the day on a hard, rocky trail. 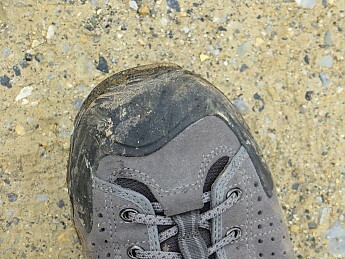 Still pretty new here, after a hike on a reasonably dirty, steep, wet trail by the Potomac River. On the downside, this isn’t your shoe if you prefer more cushioning or a softer, running shoe-like feel. The Teewinot soles give you outstanding traction. 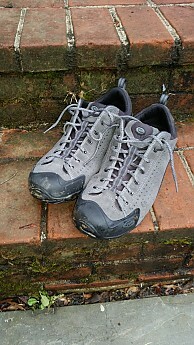 The rubber is sticky and firm; I love these shoes on rock slabs. The funky-looking lugs are deep enough to provide good traction on wet or mucky trails, and they shed mud and sand very nicely. 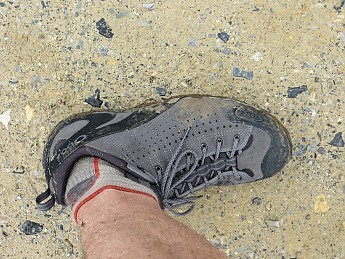 While I tended to avoid rainy days, and we had plenty the last few months, these spent a lot of time on damp trails and rocks and were tremendous—as good as any shoe I have used for traction. 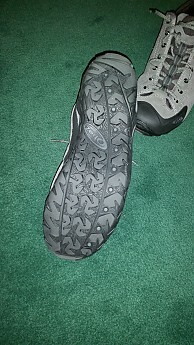 The soles after a few months of wear, but see the photos near the top, which are better. I was surprised at how comfortable these shoes were on warm days. Normally, a suede leather shoe feels pretty warm. We had some 80+ degree days lately in the D.C. area. Those little holes in the leather upper did the job. 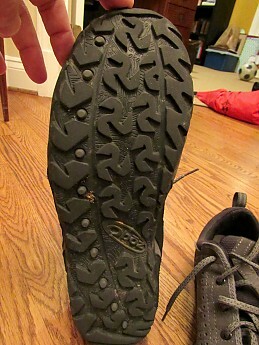 Of course, holes are a two-way street, and this is not a Goretex shoe. I accidentally stepped in a puddle, and the water went in pretty quickly. Those little holes on both sides do the job. 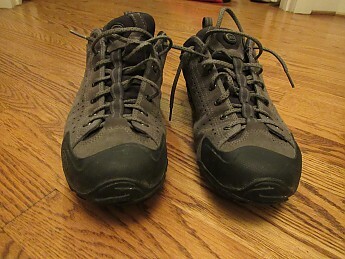 I wore these shoes for about half the time the last couple of months: regular daily walks on dirt trails and pavement, spring break walking tours of various college campuses, and hikes on dirt trails, rocky trails by the Potomac River, and a nice day-long hike in the Shenandoah National Forest. I’m guessing they have gone between 100 and 120 miles. Other than molding to my feet, as any leather shoe will naturally do, the uppers are fully intact, not a stitch loose or frayed, and the heel and toe bumpers haven’t peeled back or pulled away. The soles have a little bit of wear—to be expected for a sole this sticky. 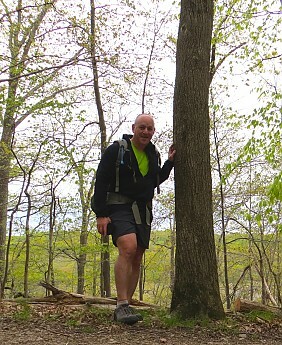 I walk 15-30 miles in a typical week—early mornings or evenings during the work week, primarily on pavement or sidewalks, and trails that range from dirt to rocks to very abrasive on weekends. There are a couple of steep sections on my favorite local trail where you have to use your hands and appreciate a shoe with good traction. 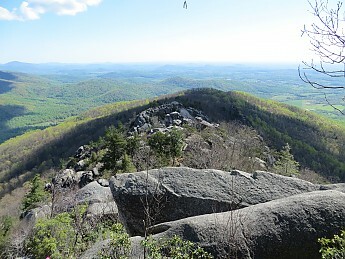 One longer hike, the entire upper half is bare rock and slabs, where these shoes really shined. Because the shoes have obvious ventilation and aren’t waterproof, I didn’t use them in the rain. For the most part, I carried light backpacks weighing under 20 pounds. Forest trail above the Potomac River, riverside trails all closed due to flooding that day. 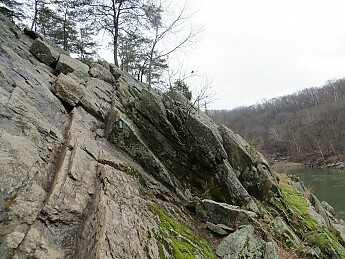 Angled rocks by the Potomac River. The trail runs up from the left, a short scramble. Often wet from runoff...no problem for these shoes. 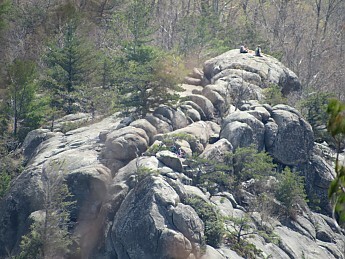 Looking back on the extended slabs on Old Rag—perfect for this shoe. 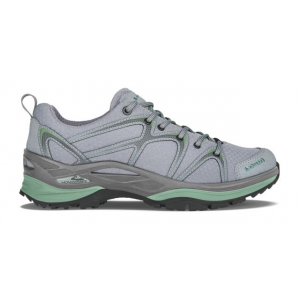 I think the explosion of hybrid trail/running shoes has obscured the category of shoes primarily intended for walking, but also suited to scrambling, the 'approach shoe' niche. The Teewinot Low bridges walking and scrambling extremely well. 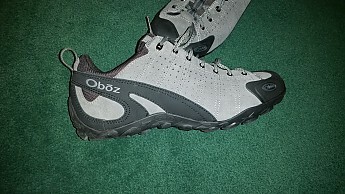 I was impressed with Oboz, which I have not worn before, and think this shoe is great—a lot to like, almost nothing to dislike. Cool hybrid trail shoes, Andrew. They look tough and long lasting! Thanks for the review! Very helpful review, Andrew. Thanks! I was wondering how the Oboz would perform and am glad to hear you liked them so well. Solid review Andrew! You're making me miss the Billy Goat Trail! 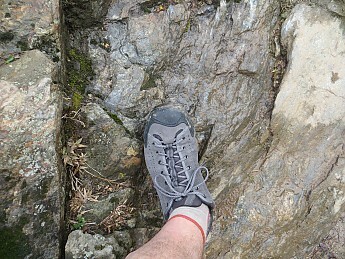 I have done a good bit of rock scrambling (I don't climb though) and having a solid feeling shoe with a sticky tread is what I would want to wear. Thanks for the review Andrew! The Oboz Teewinot is not available from the stores we monitor. It was last seen March 30, 2019	at EMS.